Analyse the progress of the University, or in fact, the progress of any university, company or organisation in the world. Explore who Portsmouth, or any other university, company or organisation, are collaborating with. See example. Identify the research strengths of Portsmouth, or any other university, company or organisation. 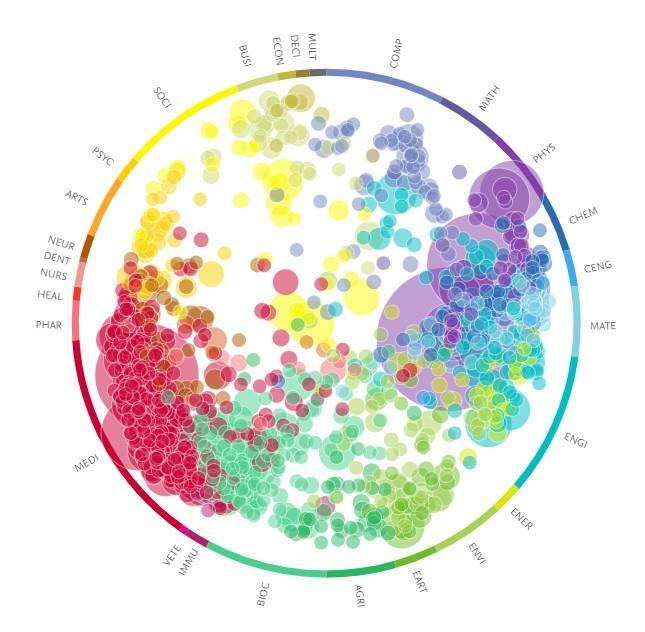 Explore trends in different research areas. Individual academics and members of research staff may also find SciVal useful to find potential collaborators or experts in your research area. SciVal is massive! So we cannot hope to provide a comprehensive manual covering every eventuality. Instead, we've given a few FAQs to cover the basics. If you would like further help, please get in contact with the Research Outputs team - libraryresearch@port.ac.uk. 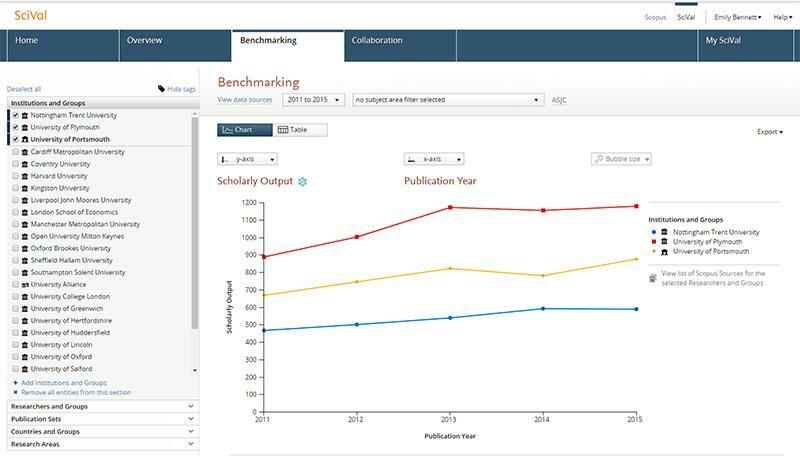 Related topics: Journal and author bibliometrics are related to SciVal because SciVal collates these metrics together. Plus you may like to read how SciVal relates to Pure. Getting started: Can you give me a very quick tour round SciVal? Where does the data in SciVal actually come from - and what are it's limitations? How can I compare Portsmouth to other universities? How can I explore areas of expertise at Portsmouth? How can I compare my department or research group with an equivalent research group or department at another university? How can I find out who Portsmouth is collaborating with? How can I find experts working in a particular area? How can I investigate the effect of adding a particular new academic to my research group or department? Getting started: Can you give me a very quick tour around SciVal? All staff and students can access SciVal - login instructions. When you login, you'll see three main tabs: Overview, Benchmarking and Collaboration. The Overview tab gives a summary of a particular university, department or research group (see above). You can look at Portsmouth or any other university, or in fact, any other organisation or business. 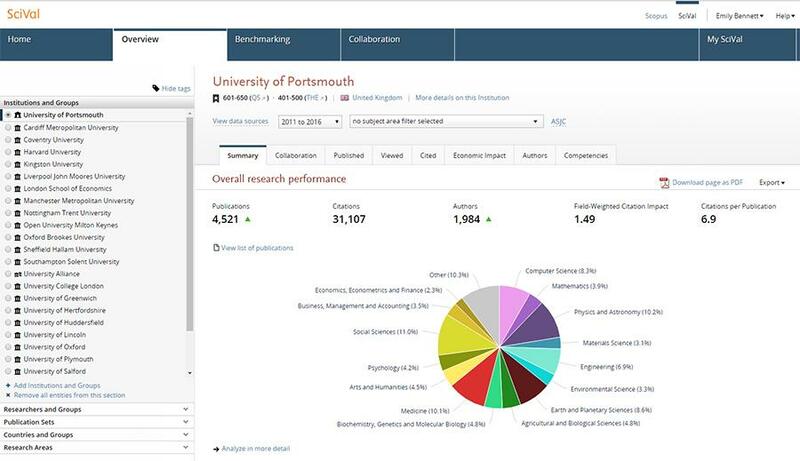 The Benchmarking tab allows you to compare universities, organisations, businesses, departments and research groups (see above). 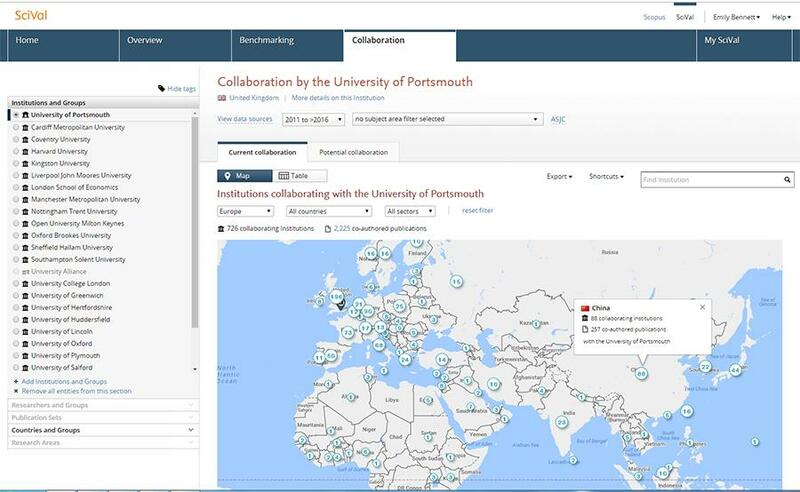 The Collaboration tab allows you to explore who Portsmouth (or any other university or business) has published with (see above). The Quick Guide to SciVal gives more detailed information about what SciVal can do. The data in SciVal comes from Scopus. Scopus is the major international publication database, indexing research articles from a wide range of subject areas. (A limitation is that while Scopus - and hence also SciVal - covers a wide range of subject areas, it's coverage of the arts and some humanities subjects is not ideal). SciVal essentially analyses the vast amount of information about citations and author affiliations in Scopus and presents it in a (hopefully!) easy to understand way. Log into SciVal (login instructions). Click on the Benchmarking tab. Select the universities you want to compare Portsmouth from the left-hand menu. Then select the metrics you want to make the comparisons on by clicking the x and y axis buttons if you are in the Chart view, or by clicking the metric 1 and metric 2 etc buttons if you are in the 'table' view. Use the Export button (top-right) if you need to download the data into an Excel spreadsheet etc. Select Portsmouth to from the left-hand menu. 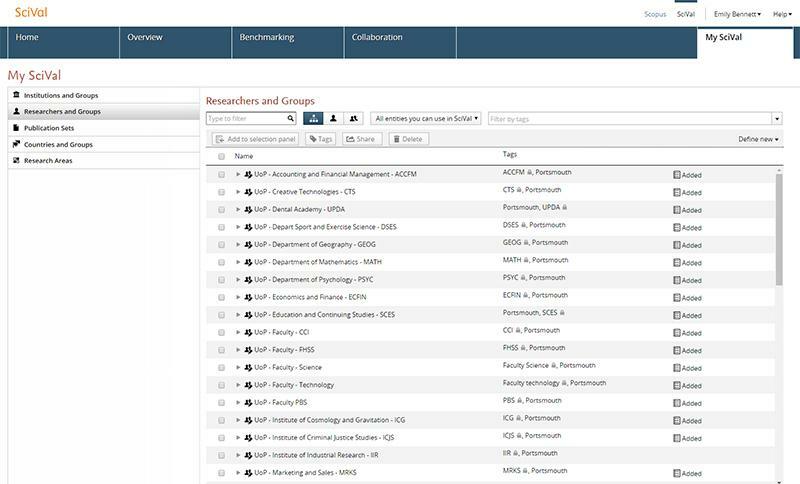 You can use SciVal (login instructions) to compare department or research groups at Portsmouth with equivalent departments and research groups at other universities. To do this, you will need to go into the My SciVal tab (top-right of the screen) and create groups containing the relevant researchers from Portsmouth and the researchers from the other university. You can then use the Benchmarking tab to make comparisons. For more information, please contact libraryresearch@port.ac.uk. Choose between either the Map or the Table view. In the left-hand menu, select the main university, organisation or business that you want to focus on (e.g. Portsmouth). Under where it says "Institutions collaborating with [for example] the University of Portsmouth", use the drop-down menu to select the country you want to see the collaborators from. (Or if you are in the map view, just click on the map). Use the Sectors drop-down menu to limit results to academic, government, corporate or medical collaborators. Click on the Research Areas in the left-hand menu. Click on the plus sign to define a new research area. This can be done in SciVal (login instructions). This can use useful to predict the effect that a particular new academic joining Portsmouth could have on the key metrics. To do this, you will need to create a Research Group containing your existing academics and then add the new academic to that group. You can do this in the My SciVal tab (above). Once you have done this, you can then see the effect adding this individual has on the metrics using the Benchmarking tab.